Dog is not for sale! 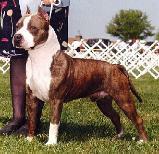 This male amstaff has a "Salad" pedigree . What does that mean? His pedigree has no consistency. He has too many different lines behind him. Typical of what is happening to this breed.